FOREIGN graduates will enjoy more job opportunities in Shanghai this year as they will no longer require two years of work experience before finding employment in the city. 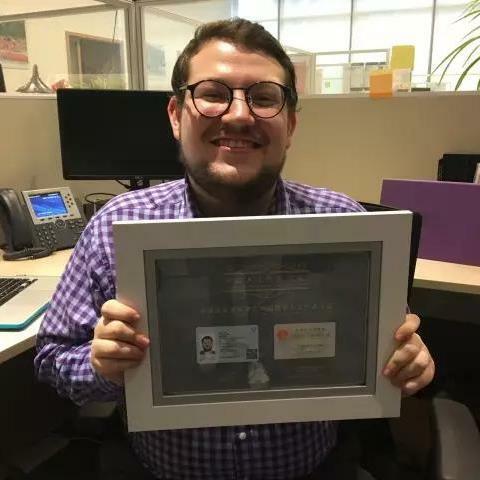 Tyler Rhorick, an American graduate of New York University Shanghai, holds the first work permit for foreign undergraduate without work experience. The change comes into effect from this month. A policy introduced in 2015 allowed foreign graduates from Shanghai universities with at least a master’s degree to remain in the city for work. From next month, “outstanding” international graduates from Chinese universities outside Shanghai with master’s degrees or higher will be able to work in the city despite having no work experience, the Shanghai Human Resources and Social Security Bureau said yesterday. By outstanding, authorities mean students with an average academic score of 80 and above, according to a bureau statement. Nina Lacome d’Estalenx, a French postgraduate student majoring in Chinese law at Hangzhou-based Zhejiang University, became the first applicant for a city work permit to allow her to take up a post offered by a logistics company in Shanghai, the bureau said. She studied Chinese language and law in France between 2012 and 2014 and began her master’s program in Chinese law at Zhejiang University in 2014. She graduated in December last year with average scores in academic studies above 80 out of 100. Under the new policy, foreigners who graduate from Shanghai universities need only gain a bachelor’s degree if their future employers are in the Free Trade Zone or the Zhangjiang area. Tyler Rhorick, an American graduate of New York University Shanghai, has already received his work permit on the strength of his bachelor’s degree. He will be working as an associate for new student programs at NYU Shanghai’s Pudong campus. He told Shanghai Daily he had thought getting the work permit would be long and tedious. “Being part of this school’s first class, I’ve learned how to move with things as they develop. When I was told last Monday there was going to be a ceremony, I at first thought it was something routine, but I realized it was about me being the first in the entire country — and thereby in the entire world, to actually do this. HR was so much help with the entire process.” He said he intended to stay in the city for at least three years. Another new policy coming into effect on Saturday will allow foreign graduates from world-renowned universities with at least bachelor’s degrees to work at multinational corporations’ regional headquarters, investment companies and research and development centers registered in the city’s free trade zone and the Zhangjiang area. Those with master’s degrees or higher degrees from such universities can also work in other places in the city. Meanwhile, foreign post-doctoral researchers from overseas renowned universities or universities in China can apply for work permits directly if under 40. The new policies are aimed at helping Shanghai develop into a world-class hub to attract and cultivate talents in innovation and entrepreneurship, as well as an ideal place for them to develop their careers and realize their own value, the bureau said.